So this past weekend, I tried to throw a legit virtual baby shower. Like for reals. If you are a regular blog reader, you may have seen bloggers celebrate a virtual baby shower for another blog. It’s totally a thing (a couple examples – here and here). So inspired by blogger virtual showers where we all post on the same day about a blogger and her new addition, I decided to take it literally. I emailed our friends and arranged a day and time for us to all “get together” online in a google hangout. With a google hangout (free) you can all join using a link and “hangout”. Sort of like a group FaceTime. We all mailed our gifts ahead of time to her house so that she’d have them to open during the virtual shower. I thought it’d be a fun way for us all to still get a chance to celebrate with her and give her some things for the new baby girl. Unfortunately, at the last minute she scheduled birthing classes and that was the only day and time she could do before the baby’s arrival, so we had to move it to another day. It ended up not working out for everyone, so it was really just us two hanging out, which was bummer for the shower, but still fun to catch up. This cake would’ve been perfect for celebrating a baby girl shower, actually. So pink! And I love me some pink! 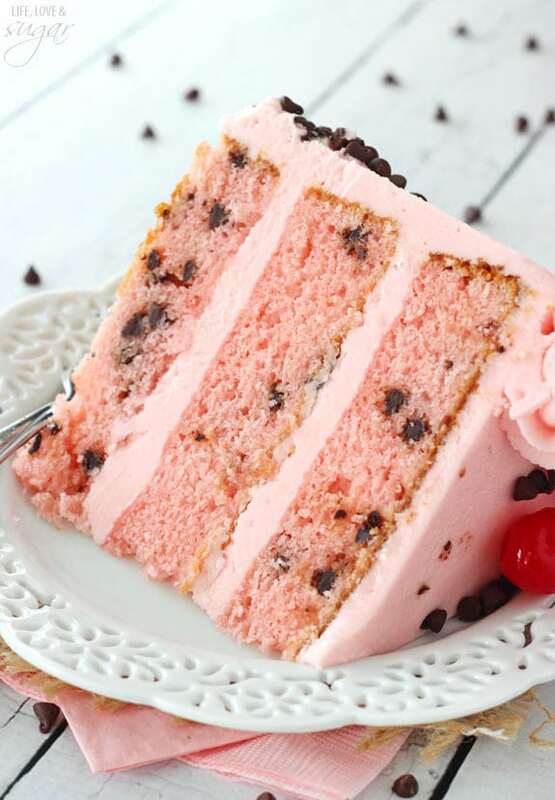 I’d been wanting to do a cherry chocolate chip cake for a while. I started off using fresh cherries because they are so in season and on sale, but they just didn’t lend the kind of flavor I wanted. It was also much more subtle and I really do prefer a stronger flavor. So I ended up going with maraschino cherries. I think it was a good call. The cake is delicious! 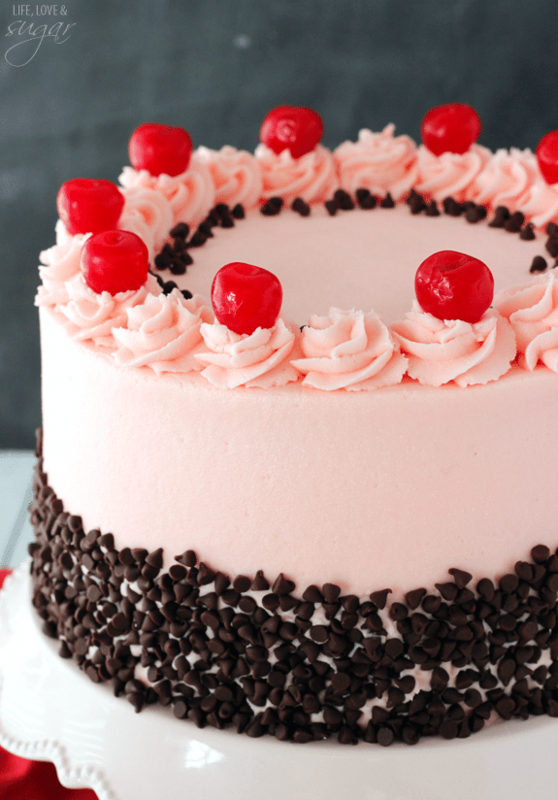 The cherry and chocolate chips go great together. I used mini chocolate chips and would definitely recommend them. I think regular sized chocolate chips might be a little too much and overpower the cherry. 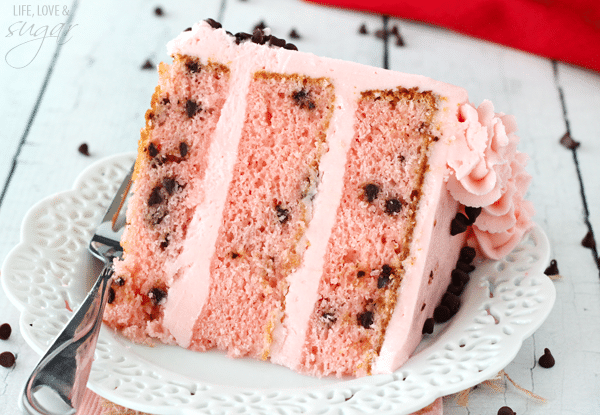 This Cherry Chocolate Chip Cake is moist and delicious and makes a really fun presentation! Enjoy! 1. Preheat oven to 350 degrees (F) and line three 8 inch cake pans with parchment rounds and grease the sides. 2. Cream butter and sugar in a large bowl on medium speed until light in color and fluffy. 3. Add vanilla extract and sour cream and beat until well combined. 4. Add the egg whites and egg in two batches, stirring until well combined after each addition. 5. 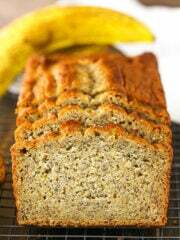 In a separate bowl, combine flour and baking powder. 6. Add about half of the flour mixture to the batter and mix until combined. Scrape down the sides of the bowl as needed. 7. Add milk and cherry juice and mix until combined, scraping down the sides of the bowl. 8. Add remaining flour mixture and mix until smooth and well combined. 10. Divide batter evenly between cake pans and bake for 24-26 minutes, or until a toothpick inserted comes out with a few crumbs. 11. Allow cakes to cool for about 5 minutes, then remove cakes to cooling rack to finish cooling. 12. To make icing, combine butter and shortening in a large and beat on medium speed until smooth. 13. Add 4 cups of powdered sugar and mix until smooth. 14. Add 3 tbsp of cherry juice and mix until smooth. 15. Add another 4 cups of powdered sugar and mix until smooth. 16. Add another 2 tbsp of cherry juice and mix until smooth. 17. Add remaining powdered sugar and mix until smooth. 18. Add additional cherry juice if needed to get the right consistency of icing. Icing should be thick, but slightly sticky to the touch. 19. To assemble the cake, first remove the cake domes from each cake layer. 20. 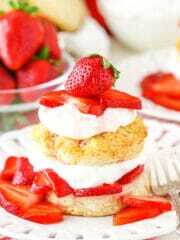 Place the first cake layer on a cake plate or cardboard cake round. Top with 1 1/2 cups icing, spread into an even layer. 21. Repeat step 20 with the next layer of cake. 22. Top with remaining layer of cake. 23. Ice the outside of the cake with remaining icing. 24. Before the icing has a chance to crust and firm, add additional mini chocolate chips around the bottom. 25. Pipe icing around the top edge of the cake and top with cherries. Cake can be made a day or two ahead, but is best served shortly after making. Also best to not refrigerate cake. You’ll beed a 16 oz jar cherries without stems for the cake. You’ll use most of the juice and some of the cherries. 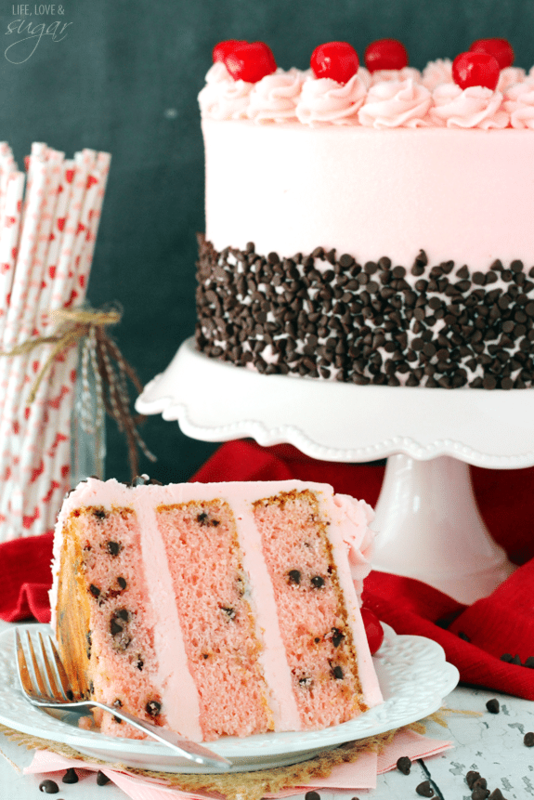 For help with how to add the mini chocolate chips to the sides of the cake, visit this tutorial. The method is the same. What a gorgeous cake. It literally makes my stomach growl when I look at it! 🙂 Pinned! Whatever the logistics happen to be of being near or far from friends, yours is really lucky. This is a beautiful cake. I never got a baby shower, so I can imagine that she’s thrilled! 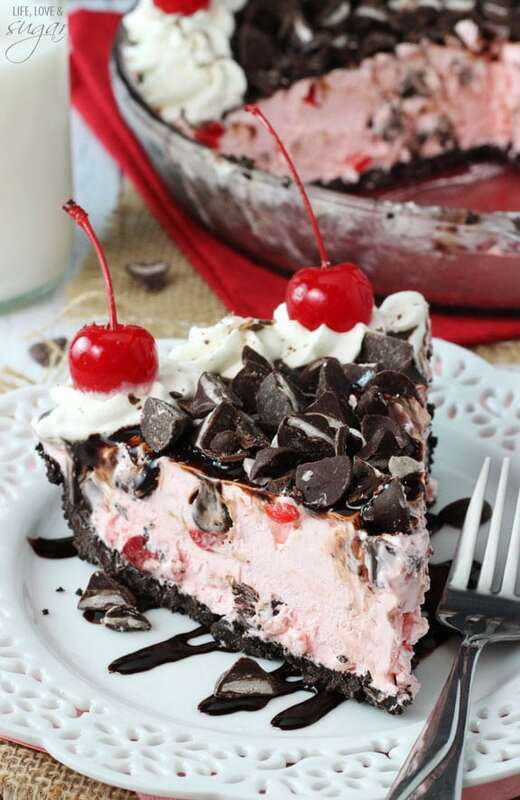 I absolutely ADORE cherry + chocolate. This cake is just gorgeous! Love that you planned a google baby shower too- such a fun idea! Every time I see your cakes I have cake envy! This cake is GORGEOUS! 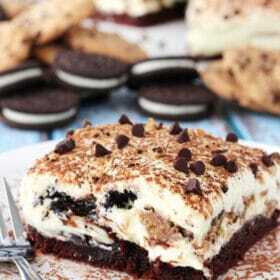 Man, I wish you lived close because I would be begging you to make this for my birthday! Your cakes are always just so perfect! I really love this one. The light pink is just too pretty! That’s a great idea for a virtual baby shower. So sorry it didn’t work out! Absolutely stunning cake. Love it. What a beautiful layer cake! It looks like it stepped out of a fancy bakery! The pretty pink colour is brilliant too. Bummer about your virtual baby shower but that is really really lovely of you to tried so hard to celebrate with your friend! 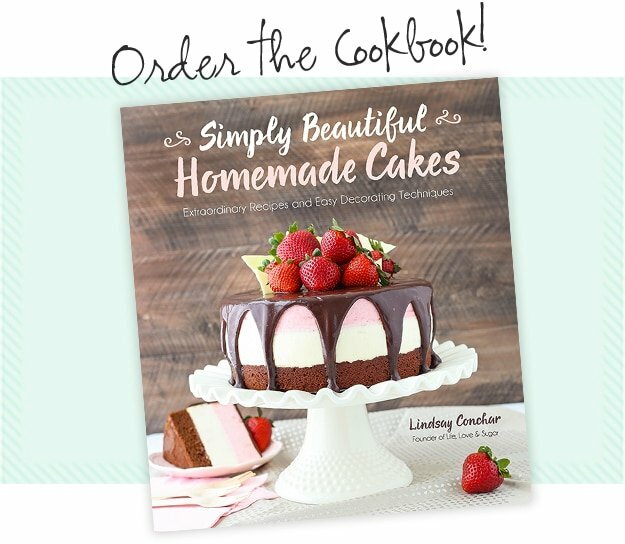 Beautiful recipe… excuse me for asking this but I live in a part of the world where we can’t find all ingredients. By maraschino cherry juice do you mean to say the same juice the maraschino cherry is soaked in? just asking and sorry if this looked like a stupid question. Not a stupid question. Sorry if that wasn’t clear. Yes, I used the juice from the jar that the cherries sit in. This cake is gorgeous! Can you bake me one….pretty please. My daughter’s mother in law loves chocolate and cherries and she would die for this for her birthday. I might attempt it but I know it won’t be anywhere nearly as beautiful as yours. How fun! Yes, the baking powder is correct. I’ll update the instructions. Thanks for letting me know! This cake is absolutely STUNNING! 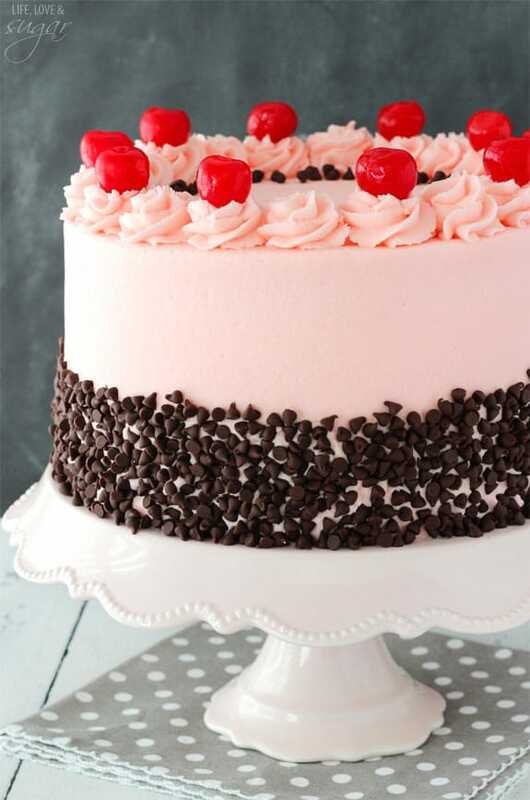 I just adore cherries and chocolate paired together 🙂 I am going to be making it for a birthday celebration this weekend – I can hardly wait! One quick question for you, why do you use shortening in the frosting? And did you have leftover frosting? 12 cups of icing sugar seems like so much! 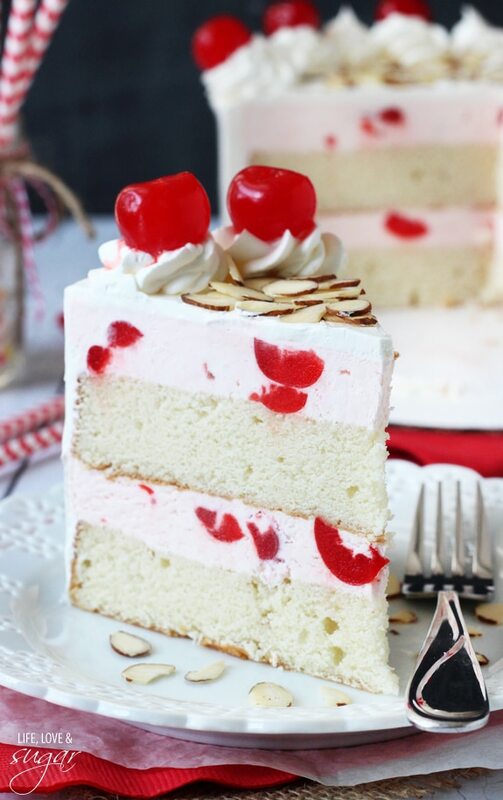 Are there any cherries in this cake? In the beginning you mentioned using fresh. Hi San! I mentioned using them, but that they didn’t give the cake the flavor I wanted, so I used maraschino cherry juice instead. I added 1/2 c. Chopped maraschino cherries and it came out fine, making it a little more lively. Hi, I just found your website via pinterest, and so glad I did. I am making cake and cupcakes for a dear friends baby shower. Do you have any recommendations for the amount of cake batter here for 3 8″ round cakes into a 9×13 rectangle? I think this would be nice as two cake layers with the frosting between. Can you give any advice? It should bake pretty well in a 9×13 pan with the same recipe. I think about 28-30 minutes for baking time. Did you try this cake as (2) 9 by 13 rectangles? If so was there enough batter? How did it turn out? Me and my daughter just tried your beautiful cake. We are waiting for it to cool so we can put the icing on, but we have a problem, all of the layers fell 🙁 I don’t know what we did wrong? Any suggestions I really want to make it a week from today for my moms birthday but I don’t want the cake to fall. I’m sorry you had trouble, I haven’t had that happen before. The only things I can think of would be to check and make sure your eggs are fresh as well as your baking soda / baking powder. Also, sometimes if the oven door is open too soon it can cause a cake to fall. I hope that helps. I would suggest using gel icing color. Wow! This looks so amazing! Love the color! Perfect for V-Day!! I just made this cake and it is awesome! My only change/addition was some cherry flavoring (I used one small bottle of Cherry LorAnn baking flavoring) to give buttercream a much stronger cherry flavor. I could barely taste cherry in it with just the juice & I like to really taste that cherry! Now it is the perfect flavor combo! Great cake!! Everyone loves it! Ooh, I should’ve done that. I found that the frosting lacked a real strong cherry flavor too. The cake itself was fantastic though. I like that the frosting is subtle! But I too wanted a little extra flavor. 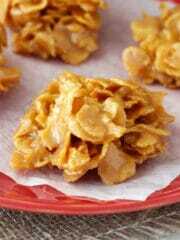 I added almond extract and a pinch of salt (I always do). This is my daughter’s choice for her 8th birthday today! I did not beat them before adding to the batter. What piping tip did you use?? Gorgeous cake, thank you for sharing! 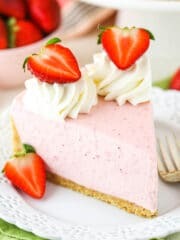 Do you think strawberry juice could be substituted for the cherry juice to make a strawberry cake instead? You could do that, but I don’t think the strawberry flavor would be as strong. 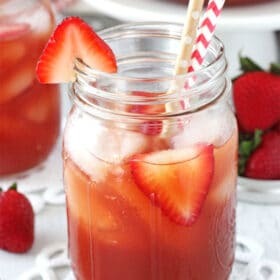 If you can find strawberry extract (I find it at Walmart), I’d add a couple tsp of that as well to add to the flavor. Here’s an example in a strawberry cupcake. Hi I’m so excited to make this cake it looks gorgeous!! 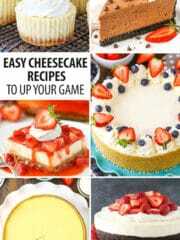 I’m going to make it for my daughter’s birthday party and I’d like to make the cake as cupcakes also any advice about the baking time and about how many cupcakes? I love the idea of using 1/2 shortening I agree about the butter being too strong in all buttercream. To make this into cupcakes, fill the liners about half way. Bake at 350 for 15-17 minutes. You’ll also only need about half of the frosting. Hi, just wondering why this cannot be refrigerated? Thank you. You can certainly refrigerate it if you’d like. I just prefer not to refrigerate cakes if I don’t have to. Cake was delicious!!! The frosting, not so much. I’m am not a fan of using shortening. The frosting was really awful. So glad we tasted it before we frosted the cake. We threw is away. There is almost no cherry flavor. All you can taste is shortening. I would love to make this cake, but I have 2 questions. I don’t have 3 8″ pans. I have 2 of 8″ and 9″ cake pans. How would I modify it to work? Also, could I use the eggs whites in the carton? Thank you! You could make two layers of cake, if you’d like. I’m not sure of the exact baking time, but I’d add around 5 minutes to the baking time, give or take. I haven’t used egg whites from the carton, but I’d think it’d be ok.
Hi Lindsay your cakes are gourgeous! 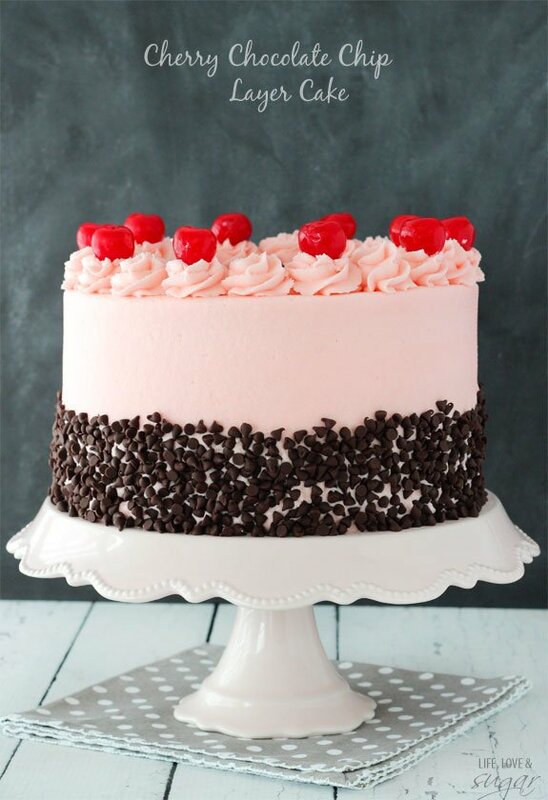 I would like to make this cherry chocolate cake for my husband’s birthday but I live in Italy and here we don’t have shortening. Could you please suggest me a good substitute? Thank you so much! ???? You can replace it with additional butter. Enjoy! Beautiful presentation and flavor. I didn’t have three 8″ pans, so I used three 9″ pans and shaved a couple of minutes off of the baking time. I didn’tpay close attention when I bought the maraschino cherries and grabbed the ones with the stems on. It turned out great because they looked fantastic on the cake with their stems. I saved 10 cherries for the top, chopped up the rest and added them to the cake with the chocolate chips. People commented on loving the cherry pieces and I didn’t end up with leftover cherries. It was a win/win. I only made 2/3rds of the frosting and it was plenty… I’m honestly not sure my Kitchenaid could have held the entire amount in the recipe! I got mixed reviews on the frosting, with some people saying they loved the subtleness of the cherry flavor and others saying they’d prefer more flavor. Using half shortening and have butter was eye opening. I will never use all butter again. Thanks for the lesson! Thank you so much for sharing your recipe!!! 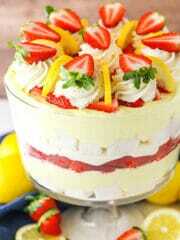 It is a beautiful and delicious cake!!! 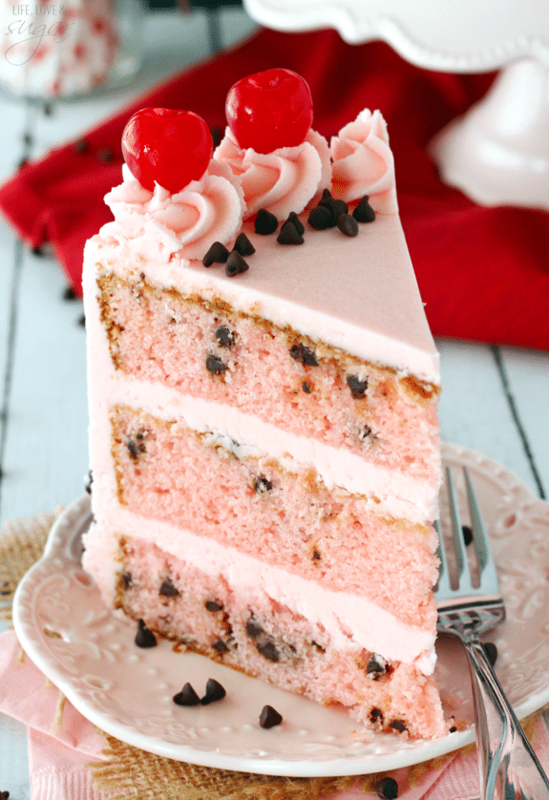 I added chopped maraschino cherries at the butter along with the mini chocolate chip …such a good combination. 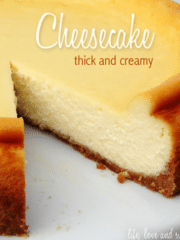 The cake is soft, sweet enough, tender and moist. I prepared Italian Merenge butter cream for the frosting. I couldn’t get enough cheery flavor from the syrup, i had to blend some cherries and add this syrup into the butter cream to get some cherry flavor. Next time i will order some cherry essence by online. It was a greatly appreciated in my daughter’s English class, they wanted to show their appreciation to their teacher with his favorite cake. Again, many thanks and enjoy the beauty of being a sweet heart!! 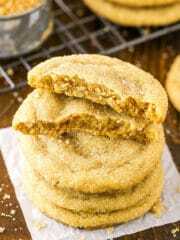 Would it be okay to use cake flour instead of all purpose? I haven’t tried it, but I imagine you’d have to make other adjustments. 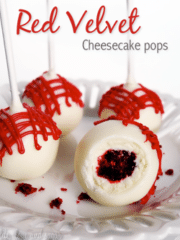 You really shouldn’t go by what Pinterest says for any recipe. They do their best, but I’m not really sure how they pull that information or where it comes from. As you can tell, it’s often not accurate. For the most accurate ingredients and instructions (plus any additional notes or tips), you always want to visit the site itself. This cake looks amazing! Just wondering how you would convert the cooking time if you used a 9×13 pan instead of the layers. I’m not entirely sure of the cooking time. Maybe 25 minutes, give or take? I just made this for my grandson’s birthday, and it turned out beautifully. He wanted a cherry cake with candy on top, so I put cherries in rosettes in a ring around the top, with mini chocolate morsels in the middle. 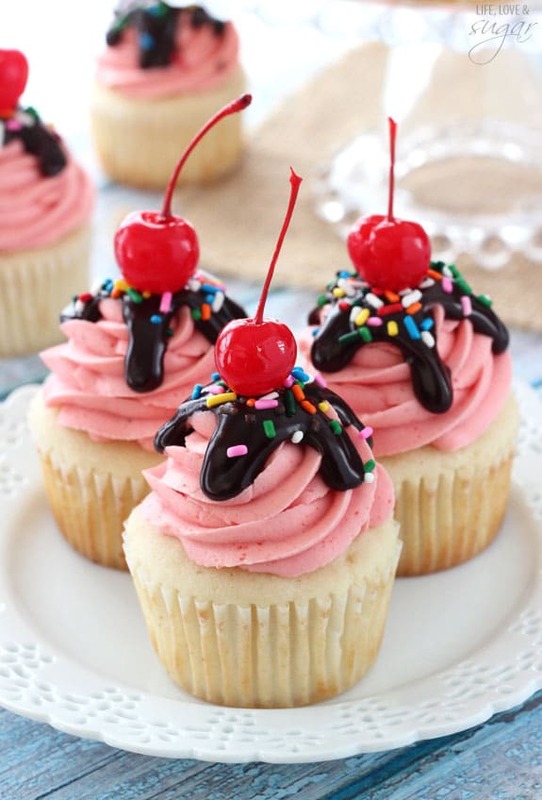 If I make it again, i would chop up cherries to add to the batter, add cherry flavor to the frosting with a little salt, and maybe use all butter. All good suggestions by others. And my Kitchenaid could not handle that amount of frosting. I had to finish with handmixer. But thanks for a beautiful cake. 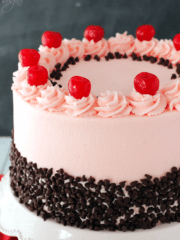 Do you use the maraschino cherry juice for the frosting also? I might suggest adding additional milk, or yogurt. Though it does change the texture and flavor a bit. So glad she was happy with it! Did you use the mini chocolate chips, or full sized? The mini ones should be evenly distributed, like the photos. Full sized ones are a little heavier and probably sink.